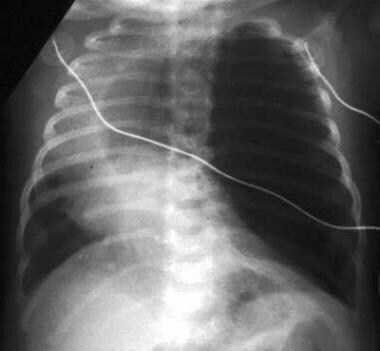 A frontal radiograph of the chest in a neonate shows marked overdistention of the left upper lobe with mediastinal shift to the right. 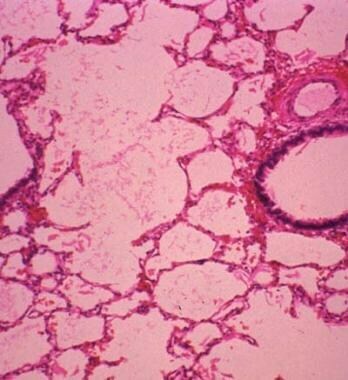 Histopathology of congenital lobar emphysema with marked overdistention of all alveoli. Resected lobe is overexpanded and shows no other intrinsic abnormality. The thorax on the involved side is hyperresonant with decreased or absent breath sounds and transillumination. Progressive respiratory distress from birth reflects the degree of emphysema; symptoms are at their worst in the first month. Occasionally, patients present in later childhood or adulthood. Congenital lobar emphysema (ie, congenital lesion) should be differentiated from Swyer-James syndrome (ie, acquired pulmonary abnormality secondary to infection). Radiography of the chest in anteroposterior and lateral projections identifies the involved lobe, the degree of involvement, and the effect on surrounding structures. If a decubitus position radiograph is obtained, the involved lung does not collapse. 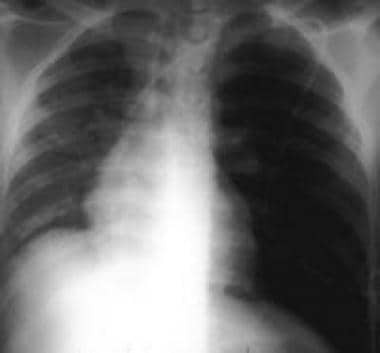 Anteroposterior chest radiograph shows overexpansion of the right middle lobe in a patient aged 18 months with suspected asthma. Lateral chest radiograph shows anterior herniation of the right middle lobe. Two-year-old patient with respiratory distress shows left upper lobe hyperaeration. Lateral chest radiograph with mild midline herniation of the left upper lobe. Swyer-James syndrome. with growth decreasing in one lung after infection. 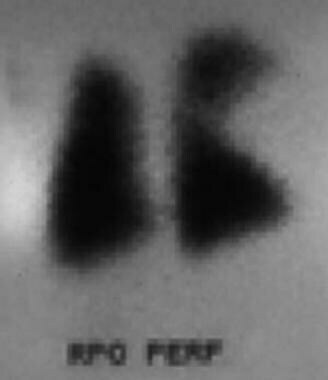 The left upper lobe is affected in 41% of patients with congenital lobar emphysema. A large, hyperlucent lung with attenuated but defined vascularity is observed. Compression of the remaining lung on that side, flattened hemidiaphragm, and widened intercostal spaces also are seen. An involved lung is seen herniated across the anterior midline. On a lateral view, the heart is displaced posteriorly with retrosternal lucency representing an anteriorly herniated lobe. The lobe is unchanged during exhalation or after placing the patient in the ipsilateral decubitus position. Chest fluoroscopy shows fixed lung and hemidiaphragm on the involved side. 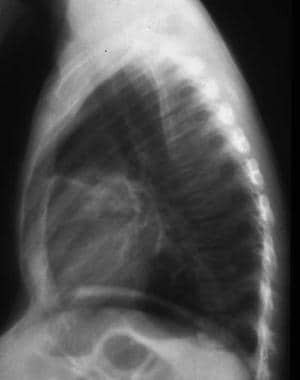 The radiographic appearance is characteristic of congenital lobar emphysema (CLE) and usually is not suggestive of other diagnoses. Be certain a mucous plug is not present, which can obstruct a bronchus, creating a "check valve" phenomenon that partially obstructs an airway. Extrinsic masses, such as a congenitally large pulmonary artery (as in the absence of the pulmonary valve), can create emphysema from partial bronchial obstruction. Usually, with careful image analysis, cystic lung disease does not mimic CLE; however, hypoplasia or agenesis of the contralateral lung may result in marked compensatory hyperexpansion of the lung, which can closely resemble CLE. Computed tomography scanning can provide details about the involved lobe and its vascularity, as well as information about the remaining lung. CT shows a hyperlucent, hyperexpanded lobe (attenuated but intact pattern of organized vascularity) with midline substernal lobar herniation and compression of the remaining lung. Usually, the mediastinum is significantly shifted away from the side of the abnormal lobe. Computed tomography scan of the patient shows marked hyperaeration of the left upper lobe and mediastinal shift to the right. Computed tomography scan indicates moderate hyperaeration of the right middle lobe. Computed tomography scanning demonstrates the characteristic appearance of polyalveolar congenital lobar emphysema of the right middle lobe. Overdistention is mild, and vascularity is fairly well developed. The left lung is compressed but not hypoplastic. Lung hypoplasia is almost invariably on the right. 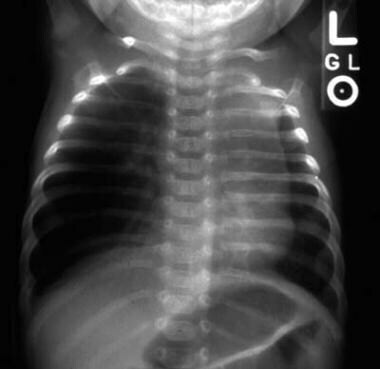 In utero sonography may show a large, fluid-filled lobe; mediastinal herniation can be seen. A prenatal diagnosis of congenital lobar emphysema is not made as frequently as in other intrapleural fetal masses. Variants include other causes of uneven lung expansion. In the neonate, a large pulmonary artery or mediastinal mass can compress the bronchus with overinflation of a lobe. Even the presence of a bronchial mucous plug can result in overinflation of a lobe. Infants with bronchopulmonary dysplasia often have uneven inflation of the pulmonary lobes related to bronchial cellular plugs or bronchial fibrosis, rendering the bronchus noncompliant. Ventilation-perfusion scanning demonstrates characteristic results (see the image below). Ventilation is initially diminished in the affected lobe, but ultimately, isotope retention is seen because of delayed emptying of alveoli in the emphysematous lobe. The markedly attenuated vascularity of the involved lobe results in decreased perfusion of the enlarged lobe. Perfusion scan in right posterior oblique (RPO) projection shows virtually no perfusion of the right middle lobe. What is congenital lobar emphysema (CLE)? What parts of the lung are affected by congenital lobar emphysema (CLE)? What are the forms of congenital lobar emphysema (CLE)? Which clinical findings are characteristic of congenital lobar emphysema (CLE)? How is congenital lobar emphysema (CLE) differentiated from Swyer-James syndrome? What is the role of radiography in the workup of congenital lobar emphysema (CLE)? 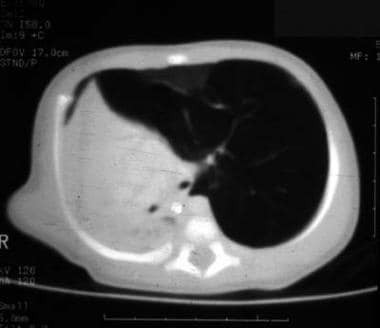 Which findings on radiographs are characteristic of congenital lobar emphysema (CLE)? 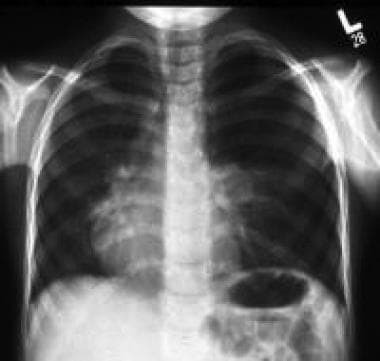 What are pearls for radiography of congenital lobar emphysema (CLE)? What is the role of CT scanning in the workup of congenital lobar emphysema (CLE)? 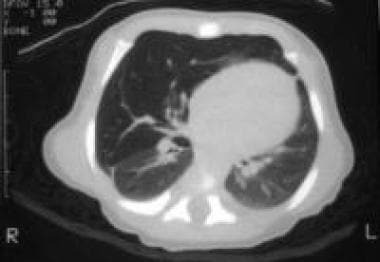 Which findings on CT are characteristic of congenital lobar emphysema (CLE)? What is the role of MRI in the workup of congenital lobar emphysema (CLE)? Which findings on ultrasonography are characteristic of congenital lobar emphysema (CLE)? 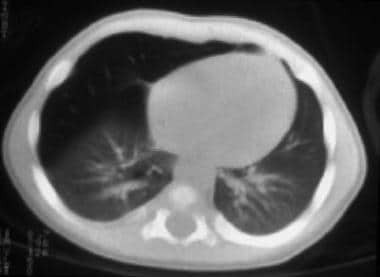 Which nuclear imaging findings are characteristic of congenital lobar emphysema (CLE)? Praticò FE, Corrado M, Della Casa G, Parziale R, Russo G, Gazzani SE, et al. Imaging of congenital pulmonary malformations. Acta Biomed. 2016 Jul 28. 87 Suppl 3:45-50. [Medline]. Mulvany JJ, Weatherall A, Charlton A, Selvadurai H. Congenital lobar emphysema: diagnostic and therapeutic challenges. BMJ Case Rep. 2016 Jun 22. 2016:[Medline]. Chia CC, Huang SC, Liu MC, Se TY. Fetal congenital lobar emphysema. Taiwan J Obstet Gynecol. 2007 Mar. 46(1):73-6. [Medline]. 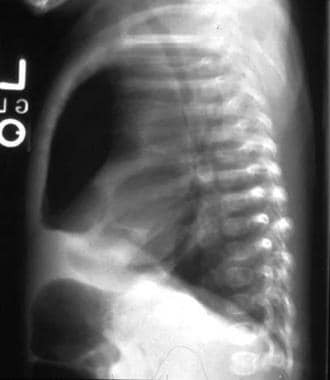 Eber E. Antenatal diagnosis of congenital thoracic malformations: early surgery, late surgery, or no surgery?. Semin Respir Crit Care Med. 2007 Jun. 28(3):355-66. [Medline]. Lin YC, Chang YK, Lu D, Shih TY. 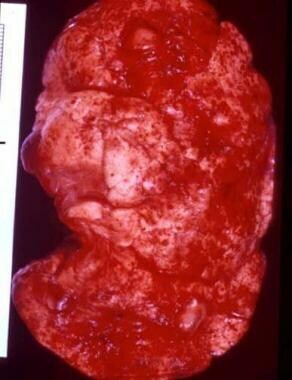 Congenital lobar emphysema mimicking cystic mass in a newborn. Acta Paediatr Taiwan. 2007 Jul-Aug. 48(4):220-2. [Medline]. Sasieta HC, Nichols FC, Kuzo RS, Boland JM, Utz JP. 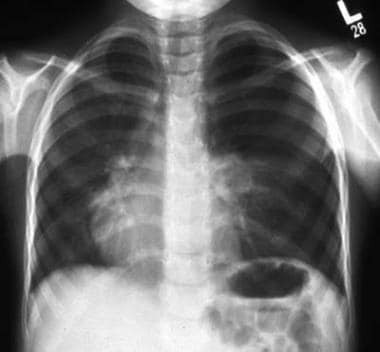 Congenital Lobar Emphysema in an Adult. Am J Respir Crit Care Med. 2016 Aug 1. 194 (3):377-8. [Medline]. Pike D, Mohan S, Ma W, Lewis JF, Parraga G. Pulmonary imaging abnormalities in an adult case of congenital lobar emphysema. J Radiol Case Rep. 2015 Feb 28. 9 (2):9-15. [Medline]. Badiu I, Hiriscau A, Lupan I, Samasca G. Congenital Lobar Emphysema in Infants. Maedica (Buchar). 2017 Jun. 12 (2):133-135. [Medline]. Cataneo DC, Rodrigues OR, Hasimoto EN, Schmidt Jr AF, Cataneo AJ. Congenital lobar emphysema: 30-year case series in two university hospitals. J Bras Pneumol. 2013 Jun-Aug. 39 (4):418-26. [Medline]. Farrugia MK, Raza SA, Gould S, Lakhoo K. Congenital lung lesions: classification and concordance of radiological appearance and surgical pathology. Pediatr Surg Int. 2008 Sep. 24(9):987-91. [Medline]. Doull IJ, Connett GJ, Warner JO. Bronchoscopic appearances of congenital lobar emphysema. Pediatr Pulmonol. 1996 Mar. 21(3):195-7. [Medline]. Congenital Lobar Emphysema. Virtual Children's Hospital, University of Iowa. http://indy.radiology.uiowa.edu/Providers. May 13, 1998. Pelizzo G, Mimmi MC, Ballico M, Marotta M, Goruppi I, Peiro JL, et al. Congenital pulmonary malformations: metabolomic profile of lung phenotype in infants. J Matern Fetal Neonatal Med. 2015 Jul 27. 1-5. [Medline]. Noten AM, Rammeloo LA, Haarman EG, Kuipers IM, Hruda J. Congenital lobar emphysema causing discrepancy between size and symptoms of ventricular septal defect. Eur J Pediatr. 2014 Dec. 173 (12):1671-3. [Medline]. Prabhu M, Joseph TT. Congenital lobar emphysema: Challenges in diagnosis and ventilation. Anesth Essays Res. 2012 Jul-Dec. 6 (2):203-6. [Medline]. Azizkhan RG, Crombleholme TM. Congenital cystic lung disease: contemporary antenatal and postnatal management. Pediatr Surg Int. 2008 Jun. 24(6):643-657. [Medline]. Lacy DE, Shaw NJ, Pilling DW, Walkinshaw S. Outcome of congenital lung abnormalities detected antenatally. Acta Paediatr. 1999 Apr. 88(4):454-8. [Medline].